Happy and Prosperous Year 2019. We look forward to partner with you in 2019. The year 2018 was characterised by high volatility regimes, broad markets dislocation, and extremely weak alpha creation, in that it has been the mirror-opposite of the year 2017, which saw steady returns in a low volatility environment, along with plenty of alpha generated by active managers. Indeed, last year has proven to be very challenging for actively managed funds, which have had one of their worst year in records in alpha creation, with only a minority of managers able to contain the markets declines. The reasons for such poor results are diverse. Style drift for equity funds is certainly one of the most significant. A prolonged period where returns were generated only by very few style factors, and where markets were driven only by a handful of stocks, prompted many portfolio managers to follow the crowd by tweaking their strategies, hence foregoing discipline in portfolio construction and diversification. Risk management leniency can also be mentioned to explain so dispersed returns. It is hard to believe an effective risk management is in place when a fund can cumulate deep negative returns along with double-digits relative underperformance. Now we can look back to 2018, and many will be relieved to do it. We are again proud to have accomplished our second calendar year of activity with excellent growth results despite the challenging environment. We have worked hard during the first quarter to launch our OpenList service, a free-access list of selected funds dedicated to Independent Wealth Managers in Switzerland. The list launched in April, turned rapidly to be a privileged entry point into our selection and advisory capabilities for many Wealth Managers. They praised the purpose of our selection and timeliness of our reports. They appreciated the level of service we organised, such as the “Meet the Manager” roundtables. During the year we have continuously adjusted our services to answer the needs of our most demanding customers; the private banks, but also the Independent Wealth Managers and the family offices from Switzerland and elsewhere. In the third quarter, thanks to a new partnership, we started to establish interesting contacts in Lugano, where we see good potential to develop our services in the coming years. We have gained new contracts from large and medium-sized Independent Wealth managers, as well as with a well established Private Bank in the Swiss German region. Happily, we closed the year with many promising prospects to follow-up. We continuously meet our expanding network of fund managers, uncovering new talents in the traditional asset classes, and the alternative asset classes, but more interestingly in the Socially Responsible Investment area. More than 300x, one-one meetings, attendance to conferences and seminars in Switzerland, Europe and other parts of the World. We have reinforced our fund selection methodology to ensure our clients still benefit from the best investment choices, whatever the environment. Last year’s market conditions offered a fantastic opportunity to test the strategies robustness of active managers in our selection, or the ones we are planning to select. The market regime changes coupled with an increase in volatility have generated plenty of valuable data to feed into our analysis. Moreover in the Alternative UCITS space, where the objectives to deliver stable returns with low volatility, uncorrelated to other assets, has been seriously challenged. WSP Master List size remains close to 100 funds, across 68 strategies in equity, fixed income, alternative asset classes and ESG/SRI. The watch list has grown to more than 90 funds we find of interest, either for the unique strategy, or the process strength they exhibit. 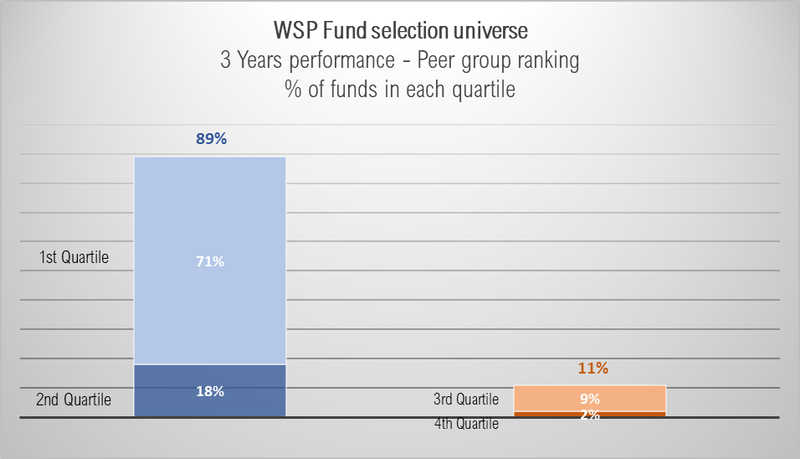 WSP fund selection has achieved superior returns over short and long term period compared to peers. In this exceptional period, where our current selection has undergone its baptism of fire, we are pleased to note that 61% of the selected funds outperformed their peers in average during the year. Furthermore, if we consider 3 years, the standard period to measure returns and assess a portfolio manager, the result remains excellent with 89% of the funds staying in the first and second quartile. Source: Universe of funds selected by WSP fund analysts for 2018, Morningstar. 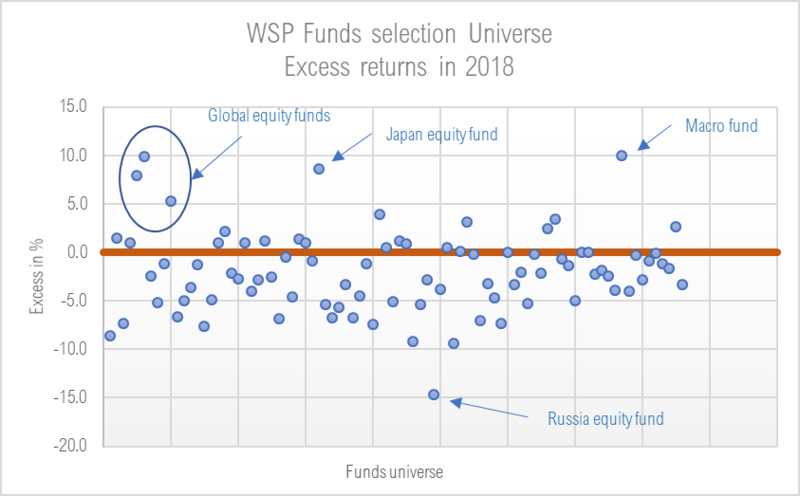 Source: Universe of funds selected by WSP fund analysts before and for 2018, Morningstar. 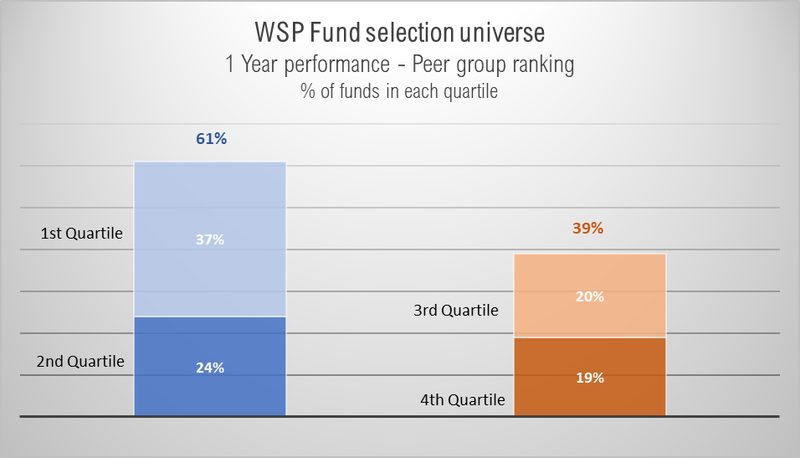 WSP fund selection achieved superior alpha compared to peers. 30% of all the funds in our selection outperformed their benchmarks during 2018. While this result seems modest, it has to be compared with peers, where for instance, only 23% of active funds in the European Equity or the US Equity Morningstar categories managed to outperform their benchmarks, and even less if we consider active managers in the Emerging Markets Equity category, with only 20% outperforming. While only 18% of the funds in the Global Large Cap Equity Morningstar categories outperformed the MSCI World index, 4 funds we have selected in that category outperformed it. Considering longer periods of time, such as 3 years and 5 years, we maintain solid results with respectively 68% and 85% of our selected funds generating alpha, hence outperforming their benchmarks net of fees. We are confident we will improve these results in the future, by drawing on our deep experience to leverage the recent events to gain insights in our qualitative due diligence process. Our investments in new analytical tools using AI methods will also contribute positively by reinforcing our quantitative processing. We have launched our model portfolios at inception of the company, in 2016. Hence, at the end of 2018 we have 30 months of performance record. All of them have created cumulative alpha over the period ranging from +157bp up to +387bps. Furthermore, this alpha was delivered with less risk, as measured by volatility, than the reference passive portfolios. Of course, 2018 was an environment that did not reward diversification. Out of the 44 sub-asset classes we monitor worldwide, only 5 closed the year in positive territory, the 39 others ended in red. The average performance for all was of -7.6%. Therefore, our portfolios made of active managers did not escape from this exceptionally tough environment where alpha creation became scarce. Furthermore, it has to be noted that by construction our Model Portfolios cannot create cash, a headwind in this environment compare to classic discretionary mandates for private clients that in most instances allow cash holding as a safe heaven. Compare to similar mixed portfolios profiles managed by local Wealth Managers, we found that our portfolios stand in the first decile. A great achievement considering our portfolios’ permanent allocation to risky assets. Finally, since inception our portfolios still maintain a comfortable alpha generation, outperforming benchmarks on an absolute and risk adjusted returns basis. Full results and comments can be seen in the end-of-year Performance Report published in our News page. In our continuous commitment to furthering our skills and abilities to succeed in a highly competitive and ever-changing marketplace, we have researched during the year on topics linked to fund selection, portfolio construction or factor investing. 23 funds’ Flash Notes published. Available in our web site’s News page. We have continued to develop relationship with prospective customers; meetings Private Banks, Independent Wealth Managers and family offices in Geneva, Switzerland, and in few instances with prospects in Europe and in the Middle-East. We spent time explaining our value proposition in details. The B2B asset management services for wealth management remains a brand-new value proposition for many, needing time and education before adoption. We have developed enriching relations leading to highly promising partnerships. We engaged with many of our new customers to deliver tailored solutions in fund portfolio monitoring and risk management, in enhancing their selection process, as well as helping them to match compliance requirements. It translated into decisive improvements in many aspects of their financial services offering, a true game changer, a true source of new business generation. The year 2019 is expected to be complex in regard to portfolio management and risk management. We are ready to tackle those challenges for you, to help you identify sound managers or strategies. For that purpose we have many projects to enhance the quality and breadth of our services. Most importantly, we want to position Wealth Solutions Partners as the partner of choice for banks and Independant Wealth Managers to migrate successfully their business into the framework of the LSFin/LEFin, drawn by the recent ordonnances proposed by the Swiss government. It will imply important changes in the way many of you are organised to perform wealth management activity. Increased oversight by the financial authorities will compel you to reinforce your operational processes, including the information to your clients on products or financial services offering. In that respect, our current analyst reports are aligned to the FIB requirements for instance. Therefore, we can only encourage you to explore our service offering as a mean to outsource those resources consuming tasks. Regarding fund selection, we will continue to leverage our partnerships with research platforms to cover long-only, alternative UCITS, Smart betas, ETFs and last, but not least, extend in the SRI strategies. Along with our proprietary database of asset managers, we will monitor new entrants in the asset management industry, focusing on niche asset classes of value not yet covered by you. To follow on our client’s increasing demand we will commit large chunk of our resources in the selection and monitoring of funds related to Socially Responsible Investments. It will be a central development for us in the years to come, to be able to help our clients to make sounds investments decision in respect of the ESG and SRI principles. In our goal to consistently improve our analytical skills, we have started to explore and will continue to build tools using a combination of AI and big data to leverage our skills and knowledge. We will monitor closely the development of blockchain technology in the financial industry to be ready to benefit from the edge it may bring in our processes. We will expand further our services in this unique fund selection platform by adding a full selection in the ESG and SRI thematic investments. Communication will also be improved through more “Meet the Manager” roundtables, and enhanced internet experience. With Private Banks we will follow closely on their business repositioning, staying ready to deploy tailored services highly integrated with their proprietary CRM platforms. We reiterate here again that we would like to bring to the Swiss investment professionals and Private Banks community our deep knowledge and extensive experience in delivering cost effective fund selection and advisory services, bringing value added solutions in an open architecture model. In the current complex world, investment professionals will seek more and more to establish partnerships with focused, knowledgeable, well experienced specialists able to understand and connect them to the world’s best solutions to grow their business successfully. We want to be one of those partners delivering with quality, independence and consistency.